Mhumhi curled up with Kebero that night. He let Kutta speak to Sacha, far downstairs, when she demanded to know why they had gotten back so late. In his cowardly way, he had slunk right by and up the stairs as Kutta started to talk, mixing the lies with the new truth that they had learned. He hadn’t said a word to Kebero, he’d just gotten on the bed and curled up around the sleepy puppy. Kebero had seemed groggy but happy about it. Bii was in the corner, hunting a cockroach. He hadn’t spared Mhumhi more than a glance since he came up. He was crouched by a little crack in the floorboards, big ears trained downwards, full of furious predatory intensity. Mhumhi watched him with a strange curiosity. He had not thought about it, but Bii was a killer. Even the little bugs had lives, after all. Bii consumed those lives. And the rats and mice that other dogs ate were alive too, and even had blood. He licked Kebero’s head, thinking. Kebero had a pulse, and blood, and underneath his skin there was meat. Just like the little hulker children. But Mhumhi had never considered eating Kebero. He licked him again, to apologize for even thinking that. 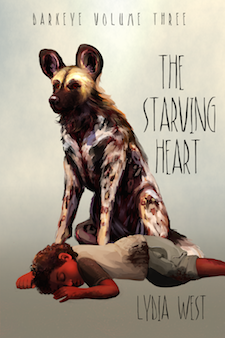 Mhumhi had always know, in a vague way, that the meat he ate had been something alive once. He could not remember that it had actually been explained or described to him, but it must have, mustn’t it? What living creatures had all that meat come from? So much meat- meat to feed a hundred hundred thousand dogs- where had it all come from? Bii suddenly lunged forward and stuck his nose in the little crack. A second later he drew away, squirming cockroach caught in his jaws, and crunched downwards. Mhumhi watched him eat it, the evident pleasure he took in consuming it, even as the cockroach’s legs still slowly rotated as he did so. Kutta came dashing up the stairs and threw herself on the bed. “What, what is it?” Mhumhi said, startled, as she crawled up next to him, whimpering. He licked her ear, feeling the dried blood encrusted on it. Mhumhi pressed close to her, whining softly, trying to comfort her as she lay there and shuddered. Kebero twisted and pressed against his stomach. His voice went shriller, up to a puppyish yap. “No, Kebero, of course not,” said Mhumhi, though the words sparked some alarm in him. Sacha could not leave, could she? Her words made Mhumhi swallow, and he turned back to pay more attention to her ear, gently picking at the dried blood with his tongue. Kutta said nothing, just closed her eyes and let him tend to her ear. Mhumhi felt Bii’s eyes on them from across the room. “We have to tell her,” he said. Beside him Kutta went stiff. Mhumhi lifted his lips in a smile and nuzzled his sister, his cheek bumping against hers. Kutta gave a soft sigh and leaned back against him. Their breath comingled. Mhumhi felt the close warmth of his sister, like the pressing weight of the hulker’s arms around his neck, the strange and gentle effect of body against body. He found himself worried, somewhat, for Kutta had not eaten anything that day for herself. They’d missed the second dispensary time since they had come back so late. Mhumhi hoped that Sacha at least had gone and eaten. None of them could really afford to skip a day right now, not with the meat being spread so thin. He fell asleep with this sense of unease within him, curled with Kutta and Kebero. Sacha did not return to join them for the rest of the night. Nor, for that matter, did Bii. The next morning he woke up abruptly, jerking his head up. There was a great deal of noise and barking coming from outside, and sunlight was filtering brightly through the curtains and onto the floor. Mhumhi recalled the fight that had occurred in the street a few days ago, with the golden jackal and the blue-eyed domestic. It seemed like an eternity had passed since then. He got to his feet, gently dislodging a sleepy Kebero, and jumped off the bed. Behind him Kutta whined softly. Mhumhi went downstairs and was startled to see Sacha there, standing by the door with her nose pressed to the crack and her short tail quivering. As he walked closer she spared him a brief glance. “Did you sleep down here last night?” Mhumhi asked, glancing at the tattered couch. “Oh,” said Mhumhi, and he went over to try and lick her chin. She tolerated it, he thought, better than usual. “Hush, I’m trying to listen,” said Sacha, very stiffly. Kutta came up and stood close beside Mhumhi, looking up at him. “The police are outside,” he murmured to her, and her ears went back. “Hush!” said Sacha, and then she suddenly jumped back from the door as someone scratched it loudly. “Open up,” the voice repeated. “Come on, Sacha, let’s not cause trouble,” said Kutta, swallowing nervously. Sacha growled and jumped up to tug down the door handle. The dog outside pushed in at once- it was a big painted dog. “Is this all the dogs that live here?” he asked, rudely pushing by them to prowl through their kitchen and living room. The painted dog paused in his prowling and sniffing long enough to give her an annoyed look, but luckily didn’t seem to find her questioning too out of line. His response was dry and tired, as if he’d repeated it several times. “The Center Road?” exclaimed Sacha, and the dog put his ears back. He seemed pleased as he said it, as if this were news that would delight everybody. Mhumhi had to admit to himself that just a few days ago it would have delighted him. “What are you doing with the domestic dogs that you catch?” That was Sacha, her gaze, as ever, very sharp. He flicked his eyes around at the lot of them and trotted out of the house with a heavy sigh. “He’ll be excited,” said Kutta, smiling. “I don’t think he’d leave Kebero like that, you know he’s fond of him,” Mhumhi said quickly. “Shift them here?” Mhumhi repeated, dumbstruck. “What do you mean, at first?” Mhumhi asked. Sacha grunted. Kutta gave Mhumhi a bewildered look, then trotted up the stairs. Sacha sat by the door and growled softly to herself. Mhumhi felt that it would have probably been appropriate for him to jump to his sister’s defense then, but then again Sacha was absolutely correct. “I guess,” said Mhumhi, feeling rather guilty for the eventual browbeating that Kutta was going to receive, and also wondering if he couldn’t spirit himself away before it happened. Kutta returned then, trotting down the stairs with Kebero in tow. He pushed ahead of her and fell into a play-bow, wagging eagerly. Kebero yapped and ran up to whine and lick under her chin. Mhumhi swooped in from the other side and did the same, nearly lifting Sacha off her feet with one overeager nudge of his nose. Kutta half-lunged as if she meant to do it too, but then pulled herself back, perhaps taking pity on her oldest and littlest sister, who was squalling and squirming in outrage. They got themselves sorted out, finally, and Kebero positioned in the line between Sacha and Kutta so he could be under the sharpest scrutiny the whole time. Mhumhi was rather amused by this, as it meant that they had inadvertently organized themselves from smallest to largest. So much for not drawing attention to themselves; they’d make the strangest train Oldtown had ever seen. She nudged the door open with her nose and paw and they did so, all single file. Kebero was a mess of floppy limbs and excitement, and Kutta kept having to gently tug his tail to keep him in line, but at least the only ones around were their neighbor foxes. They didn’t spare them more than a glance or two, Mhumhi was relived to see. It seemed the mood of the neighborhood was rather low. Sacha hugged the line of buildings, leading them through a narrow alley with cobblestones down onto Food Strip Street and down, farther south towards where the city started to get really faded and dusty. Mhumhi noticed that there were more foxes in the area than he was accustomed to seeing; perhaps Sacha was right, and they were already starting to be pushed out of their homes. Sacha lead them across the street to a large shop building with a faded blue awning. Mhumhi saw that the bottom pane of glass in the door had been broken. It smelled like there were a great number of dogs inside. Sacha went purposefully towards the opening in the glass, but before she could, a large red fox emerged from a turned-over trashcan that had been lying under the awning. Mhumhi could see more movement within. The fox was walking towards them somewhat stiffly, but then she spotted Sacha and his bushy tail wagged. “Is it about the Center Road dogs?” asked Kutta, and Lisica gave her a startled glance. She went back into the trash can. Mhumhi could hear soft yipping and rustling from the darkened interior and a bright-eyed fox puppy peeped out at them for a moment before vanishing back inside. Sacha redirected their attention with a grunt and carefully stepped through the broken glass into the shop. Kutta picked up Kebero by his scruff and squeezed after her, the puppy’s dangling legs just brushing the lower edge. Mhumhi went last, sucking in his belly as he stepped through. Inside the shop it was very dim and smelly, and crowded with growling, whining, yapping small dogs. There were a great number of booths and tables, as well as a long counter, and the dogs covered these and the floor in a confusing mass of shifting furry forms, leaping up and down from surfaces, getting into minor squabbles, searching for family members that had gotten separated into the mix. Sacha lead them to a booth with dark leather seats. There was a pair of chillas already sitting on top of the table alongside a crab-eating fox, but they gave Mhumhi a startled look and hastily hopped down, one after the other. The crab-eating fox looked uncomfortable, but stayed, shifting aside to make room as Sacha hopped up onto the booth and then on the table. Kebero followed her, getting a bit of assistance from Kutta as his clumsy paws slipped on the leather. Kutta hopped into the booth but deigned to sit on the table; Mhumhi decided to follow her example when he tried to jump onto the table and bumped his head against a low-hanging lamp with a stained-glass shade. The thing swung wildly for a moment, casting colored shadows every which way and attracting a great deal of attention. Mhumhi backed back into the booth and tried to make himself look like a fox. The stares receded when Lisica entered, along with a male fox and three puppies. Mhumhi surmised that they’d all been crammed into the trash can together. Behind Lisica there walked a female golden jackal. Sacha gave a soft growl of surprise and looked back at Mhumhi from her seat on the table. Mhumhi sunk further down into the leather seat, resting his chin on the table. It was the jackal he’d stopped from fighting with the blue-eyed domestic. The jackal herself was panting, flicking her gaze between the great mass of foxes; it did not seem to fall on their table in the back. Lisica jumped up onto the high counter and then again to sit upon a derelict soda fountain, affording herself the highest vantage point, and gave a screaming bark for silence. “I’ve brought Sundu here to speak to you tonight,” she said, looking down at the jackal- a large space had cleared around her on the floor. “But first, I’ll tell you the news: we’ve now got a few hundred squatters by the front of Oldtown. I’ll tell you the streets…” She listed them, and the growling and muttering got louder with each name. The others around her roused in a brief rabble of yaps and growls of agreement until Lisica gave her chilling bark again. “Be quiet for a minute. We still need to hear from Sundu. This relates to our primary concern.” Lisica’s sharp eyes scanned the crowd. Mhumhi thought they lingered on their table, but perhaps it was to admonish the short-eared dog, who was panting and smiling. The crowd got quieter at this. Mhumhi saw Lisica’s mate nosing at their three pups. Lisica jumped down from the soda fountain, and Sundu the golden jackal cast around a bit before leaping up onto a nearby table. Sundu trailed off. Mhumhi could smell the scent of fear rising in the room. He looked worriedly over at Kebero, but the puppy had fallen asleep some time ago, curled up beside Sacha. He noticed that Sacha had put one foot on him. A brief blanket of silence fell over the crowd. Mhumhi saw all their staring eyes, wide and frightened, showing white. “Muck-coated killers!” bawled out the short-eared dog. Lisica ignored her. “Finally,” growled Sundu. There were a few murmurs of agreement, though there were also several derisive hisses. “Nor anyone else,” said Sundu. “So what? Get to the point!” barked the short-eared dog, and now even Sacha shot her an irritated look. This seemed to carry a lot of meaning throughout the shop; looks were exchanged, lips raised. Mhumhi poked Sacha with his nose. “Sundu,” said Lisica, and Sundu shut her jaws tightly, though her teeth still showed. With this she hopped down from the counter. At once the crowd burst into a frenzy of loud barking and yapping as all the other dogs tried to collaborate at once. The crab-eating fox at their table turned eagerly to the short-eared dog. Mhumhi was fairly ready to go himself, and he slid down off the booth underneath the table, letting his rear legs come last. The chillas, which had apparently taken refuge down there, yipped in a startled way and huddled closer together. Mhumhi glanced at them and tried to give them a friendly tail wave, but it was hard since he was already forced to crouch. In front of him Sacha hit the leather with a thud and then hopped down to the carpeted floor. Kutta followed her off the bench with a great deal more grace than Mhumhi had, especially considering she was carrying the heavy, groggy Kebero by the scruff. The other dogs gave them a wide berth, many looking at Mhumhi’s coat, but recognizing him underneath it, he hoped. They were almost to the door when Lisica stopped them. In Kutta’s jaws, Kebero gave a startled whimper. Mhumhi went to lick him, rather shocked himself by Sacha’s harsh admission. Sundu gave a terrible snarl and lunged at her. Kutta dropped Kebero and leapt forward, arresting the golden jackal with a sharp bite on the muzzle. The two of them reared up, snapping, until Sacha gave a sharp squeal. Kutta backed off, giving Sundu a hard stare. Sundu still snarled. Sundu rumbled, but the crowd of little dogs around her was starting to press in closer, many of them looking angry, and she seemed hesitant to make another move. Sacha turned, her short tail poking straight up, and hopped through the broken door. Kutta followed, shooting a final dark look at the jackal, and Mhumhi, his tail tucked tight under his belly, picked up Kebero and went last. Mhumhi put down Kebero. The puppy was trembling and whining, and Mhumhi wasn’t much better off himself, panting and drooling. “In there!” exclaimed Kutta, her tail rising in her anger. “Yes, in there, when you spoke about our mother being-” She stopped and looked at Kebero. Kebero whined and put his ears back. Kutta actually growled. “Sacha,” Mhumhi whined, unable to keep quiet. She ignored him, advancing on the trembling Kutta. “Don’t you dare ever growl at me again,” said Sacha. It got deathly quiet. On the ground, Kebero shook, pressing himself against Mhumhi’s forelegs. “Don’t you mean, dragging it out for you?” Mhumhi said. Sacha went stiff. He felt the urge to back off, to lie down for her, but he quelled it. Sacha stared at him a moment, then lowered her tail, and laughed. Mhumhi opened his mouth to reply, but a sudden whine from Kutta stopped him. She was looking at Kebero, and with a glance at Mhumhi, went to pick him up by the scruff again. Mhumhi had little choice but to follow his sisters back to the house. The walk was near-silent, aside from Kebero’s occasional whimpers. When they got to the doorway, Bii met them. The bat-eared fox was panting hard, blood dripping from his tongue. Kebero kicked and squirmed, twisting from Kutta’s grip so that he dropped to the ground. He ran to huddle and lick at Bii, whining. “What happened to you, Bii?” Kutta asked, licking her chops. “We’ll discuss it,” said Sacha, putting her small ears back. Bii pressed his jaws together, but seemed to take the hint. He got off Kebero and coaxed him into the house. “Let’s go,” said Sacha, and Mhumhi and Kutta now exchanged a confused look. “You were off on me for not being honest,” muttered Kutta, falling in step behind her. “I wasn’t doing it to lead anybody through sewer muck,” said Sacha cooly, and Kutta got quiet. Mhumhi put his ears back, though he was also somewhat impressed. He wondered how much they really had left to tell her. There were a great number of new dogs, evicted from their homes, starting to wander around their street and along the normally deserted food strip street, so Sacha had to lead them far to find a quiet area. Eventually she stopped in a quiet alley with nothing but a series of blue dumpsters. Mhumhi was chilled, for he recognized the place, but there was no reason for him to feel frightened- he hoped- as there was no hulker here now. Sacha sat down on the warm asphalt with a great sigh. “Sacha went purposefully towards the opening in the glass, but before she could,” before she could what? enter? “The fox was walking towards them somewhat stiffly, but then she spotted Sacha and his bushy tail wagged.” is the fox a she or a he? What’s a chilla? I’m sure I haven’t heard of all possible animals, but the internet also doesn’t seem to know this one. “Kutta hopped into the booth but deigned to sit on the table” wouldn’t that mean that she sat on the table even though it was beneath her dignity? A chilla is a species of false fox or zorro that lives in South America. It’s sometimes called the South American gray fox (though it is not closely related to the gray foxes that live up north). Here’s the Wikipedia page. Also, I really appreciate your comments; they’re going to be very helpful when I start editing.